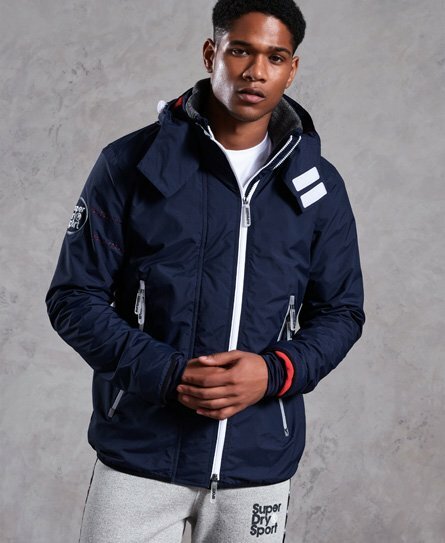 Superdry men’s Sport Wintersprinter. This is perfect for throwing it on at the weekend for a sporty look or wearing it post-workout. This Sport Wintersprinter features two way branded zips, a ribbed collar, two external zipped pockets, an inside pocket and a hood with bungee cord adjusters and hook and loop fastening. The Sport Wintersprinter also features thermal properties within its full fleece lining and breathable detailing on the arm and back. This jacket also features branded zip pulls and Superdry sport logos on the arm and back of the jacket. The Sport Wintersprinter has been finished with thumbholes in the cuffs and reflective detailing throughout, making it the perfect item when the evenings begin to draw in earlier.